I keep it real and mostly only buy cheap jewelry because I tend to lose or break almost all of it. I mean, I go through at least one freak out a day thinking I've lost my wedding ring. I've started wearing a fake ring to work and when we travel because it's that bad! 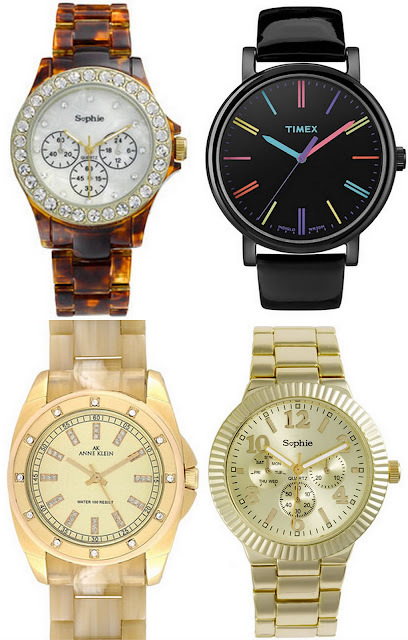 Anyway, I was cruising my favorite secret for cheapies, Nordy's junior's section, and found these cute and super affordable watches. I'm totally digging that tortoise and rhinestone gem, and I especially love it for it's $18 price tag. 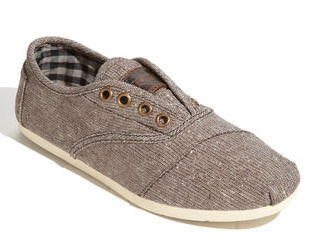 I'm also picking up a pair of these metallic brown Tom's cordones. I've worn my Tom's so much that I have a hole in them :( so I figured I'd give these a try. I think they'll be fun on casual Friday with some skinny jeans. I want that tort watch!!! !